Travelling by train can be an easy way of handing over the hassle of getting from A to B – but what are your rights when it comes to letting the train take the strain? The rail system can seem complicated to navigate – there are currently 30 private companies providing UK rail services. 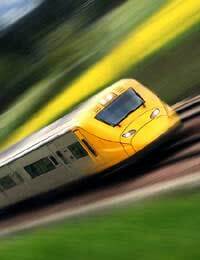 Your rights with train travel are broadly the same across all companies though. You can buy tickets for train travel in advance online, and you will often find good deals if you are able to book your tickets in advance. There are two main websites available that let you compare train times, journeys and prices – and let you look at options for single journeys as well as return tickets. If you can be flexible with times and dates you’re likely to be able to pick up a better deal. there is a notice specifically saying that you can buy a ticket on the train. Otherwise you should always buy a ticket before you get on the train- even if the ticket machines are out of order and the queues are terrible. Some stations will let you buy a Permit to Travel if you’re in a hurry and about to miss a train, which will cost you anything up to the value of your ticket. A Permit to Travel is valid for a set amount of time for specific train travel – for example two hours – and when you are approached by the train staff or you reach your destination station you can exchange the permit for a ticket and pay the difference in fare. In some case you don’t have to pay for Permit to Travel but just exchange it for the ticket as soon as you can. Don’t board the train without any kind of valid ticket - you could have to pay penalty fare. These penalty fares can be expensive! In some cases, if the train staff believe you are deliberately fare dodging, you could even be prosecuted. If you have a railcard, you should show it when you buy your ticket, either on the train or beforehand. If you intend to travel further than the destination on your ticket, buy another ticket before you get on the train. You could end up with a penalty fare if you’re caught out, and again in some cases prosecuted. Every operating company has its own Passenger Charter which sets out the commitments it makes to its customers. If your train is cancelled or delayed and you decide against train travel after all, you should take your ticket back to the ticket office you bought it from and ask for a refund of the cost of your train travel. If you bought tickets online, or from another station to the one you are travelling from, you are just as entitled to a refund but you might not get it on the spot. Don’t accept any administration charges, there should be no fees. If your train is delayed for more than an hour you could be entitled to compensation, although this is usually in the form of travel vouchers. Some train companies also offer compensation if you have been delayed for less than an hour. The proviso is that the delay has to be ‘within the company’s control’ so if the train breaks down you are entitled – but if there’s an accident on a railway line, you probably won’t be. You’ll need to check this with the rail company concerned. If you find yourself stranded at a station due to a train delay or cancellation – again if it’s something within the company’s control – you’re entitled to assistance from the train company. This could be alternative transport such as a taxi to your destination or overnight accommodation. What if Something Happens to My Luggage? Legally, when it comes to train travel you are responsible for your own luggage, and train companies will reject liability for any lost or damaged luggage on their trains - unless the damage or loss was expressly caused by the neglect of the company or its staff. There is an organisation called Passenger Focus (which was previously known as the Rail Passenger Council) and this is an independent public body set up protect the interests of rail passengers. dealing with complaints that haven’t been settled by train companies. Hi, I am in dispute with South West trains, following a lost ticket saga. I bought a ticket from Bromley (Kent) to Sherborne in Dorset and managed to lose the ticket when changing trains at Clapham junction. Despite having a receipt for the ticket, I was forced to buy a new ticket by the fares conductor on SW Trains. I wrote to SW after the event and sent them the two receipts, but had no response until after a month and several emails, I finally had a reply to say that they did not consider a receipt to be proof of purchase and would not refund the double fare. Their argument being that owing to high levels of fraudulent claims, they considered it possible that I had purchased the first ticket and then given it to a third party, before claiming it lost! In most normal cases a receipt is indeed proof of purchase under the sale of goods and services act, but not apparently in this case! The logic that I would have boarded a train in Bromley and then gone through two separate barrier checks without a ticket seems bizarre to me. If I had given the ticket away, how on earth would I have boarded the train. It seems simply a case of refusing to honour aclaim, by whatever means available to them. I would be interested in your thoughts, is there an ombudsman to take a complaint to? Travelling on Great western rail I had my suit case stolen they now inform me it is my liability. You're not allowed to keep large cases on corridor as it prevents passengers from getting by. It was too big for overhead space so had to leave it in case rack. No security to prevent it from being taken which could have been in 30 seconds. I am sure under new EU legislation these companies can be held liable for theft of passengers' luggage. If anybody knows anything about this law which was passed in October 2010 I should be obliged to hear more about it.